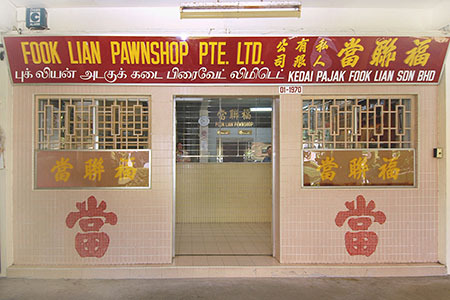 Fook Lian Pawnshop began its operations in 1959. It was originally located at Upper Paya Lebar Road before relocating to its present premise in 1988. The current shop unit was bought over and fully paid for as we believe in long term business.It has been the goal of our founders to build a relationship with our clients whom we hope to be friends with. In fact many have been our friends for many years and some from a young age till their old age. We strive to provide a personal service with sincerity & integrity so that our clients can have peace of mind when they pledge their valuables with us.